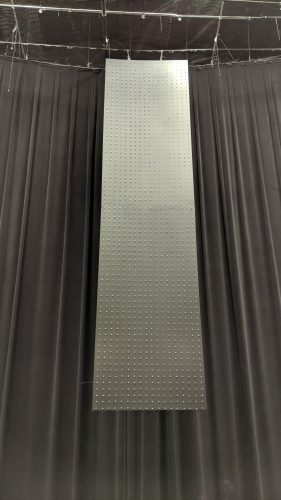 Well you got yourself 8 16 foot tall, 4 foot wide LED Matrix panels. How are you going to get them in the air? Well it takes a bit of imagination, some physical labor and a dream that this will be fantastic once you get it all up and running. This is how I did it but you may have other ideas just as good, worse or better. Here you see the 1″x1″ wooden boards I used as a mount. The eyelets are screwed into the top of the wood. I say board length of 2 feet in the text. Mine is a bit longer on this one but most of mine are at 2 feet long. I took 1″ square 8 foot long pieces of wood or furring strips some people call them and cut them into 2 foot ections. Each full panel gets 2 of these. At the top of the full panel I counted over about 5 LED columns and placed one of the cut furring strips between the 5th and 6th column and aligned the edge of the board with the top edge of the panel. I did the same on the other side. Count 5 columns from the right then place your board there, aligning it with the top of the panel. These boards are placed on the back side of the panel just in case you haven’t figured out what I’ve done here. From the front, take a screw gun and screw in 3 screws into each board from the front into the wood. One screw about an inch from the top, on in the middle and one near the bottom of the board. Don’t screw them in too tight as to smash down the coroplast. Just make sure they are really snug. Drywall screws work great. Do it for both boards. One you have the boards attached to the panel, you now have your mount. Drill about a 1/8 inch hole in the very tops of the boards about 1/2″ deep in the absolute center of the board top. Screw in a heavy duty eyelet into both boards. You can then attach anything you need to from these to hang the panels. I must mention here that s total weight for each full 16 foot tall panel with the power supplies attached is only about 28-30 pounds. You can hold the whole thing up with one arm for a short time. They are not that heavy. The three screws above are all it takes to hold that weight. The heavy duty screw in eyelets will not pull out due to weight as long as they have a decent metal thickness and you don’t strip the holes they get screwed into. If you feel that is not enough then you can use your imagination and rig up something a bit heftier. Now we are ready to get them hung up in the sky. There are two ways you can do this. 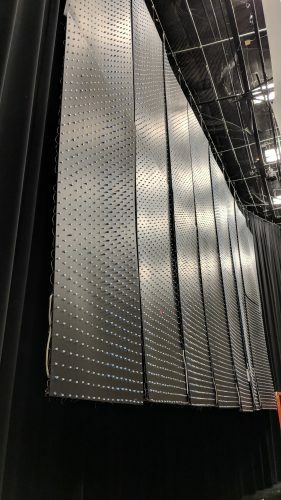 If you have the room, assemble the whole matrix (all 8 full panels) on the floor, face up with the tops under wherever you are going to mount it. Attach the eyelets to heavy duty poles like 3/4 inch or more conduit or something similar. I used parachute cord with cleats but you can use anything that works for you as long as it can hold the weight. You will then need to have some type of rig that can pull the main bar (the conduit or other bar) up into the air dragging the panels with it as it rises. I would have done it this way if I had the room and manpower but I didn’t so I did option 2. It may take several people to pull this up into place but I will leave those particulars up to you. This was my first try. the support bar sagged a bit so I used 1 inch conduit for the support and it didn’t budge. Parachute cord works great and can handle way more than 30 pounds. This is what I did. I used a lift. I lifted each panel individually into the air and drove the lift with the panel hanging off of it and put it into place once I drove it to where it needed to go. 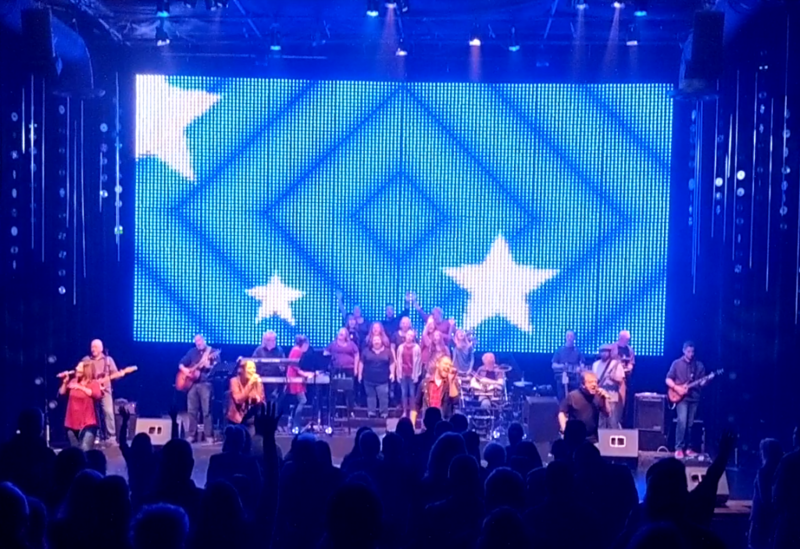 Once I got there, I attached the parachute cord to each eyelet then wrapped the cord over a strong truss bar that I have across the back of the stage for this purpose. I then pulled the parachute cord tight and used a rock climbing cleat to hold the cord in place so I could later make height adjustments. I did that for both sides of the panel. Once that panel was in place, I lowered the lift, got another panel and placed it next panel I just put it. I did this until I had them all hanging. I then went and aligned them all, making sure all the heights were equal and the sides matched up. It takes a while to get it all adjusted this way but it works. After you have all the panels aligned and even, you will want to tie them together. You can do this on the ground if you are doing step 1 above. Since I did step 2, I drilled small holes about every 3 or 4 foot and placed a wire tie through the wholes and bound the panels together. This holds them securely and they won’t move. The more you do the better but make sure it doesn’t go out of alignment while you are doing it. I also put 1 foot heavy duty rubber tie down straps through the eyelets and attached to another safety bar as a safety precaution just in case I didn’t get a cleat tightly fastened or some other unforeseen problem. They are secure. 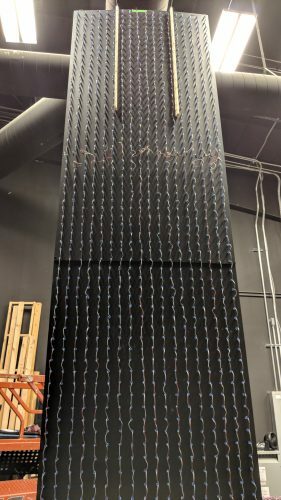 If your panels are wanting to bow or bend where the edges meet, you can take the smallest pvc pipe you can by really cheap and slip it under the LED wire hoops on the back of the panels, joining 2 or more panels together. This keeps them really even. Just slip in a 8 foot pvc pipe if you have a problem area. A little bit of bowing will not hurt anything. You will only see it when you are off to the side of the panels. Anyone from a short distance in front will not notice, even with the house lights on. If you do not want any bowing, use the pvc pipe where you want it straight. The initial hanging of the panels before alignment and tying together. Okay, that about sums up how to hang them. Next we will talk about the final Electrical wiring and the wiring to the controller. That will be in the next couple of days.